Erect, decumbent or prostrate subshrubs, never tuberous. Leaves subsucculent to succulent, simple or ternately lobed, with the lamina or leaflets someitmes articulated to the petiole. Petioles often persistent and spiny. 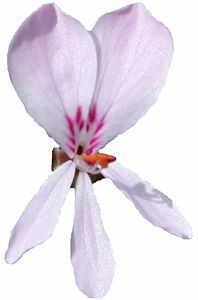 Flowers usually very irregular, 5-petalled, petals white to pink, hypanthium often longer than pedicel. 5-7 fertile stamens. Inflorescence a reduced pseudo-umbel, not branched. Basic chromosome number, x = 11. Further characters, on which the species are separated into a section are pollen morphology, and phenolic composition. See S. Afr. J. Bot. 171 (1990) 15-26 for details. acuminatum (Thunb.) DC. syn. laevigatum (L.f.) Willd. cataractae (Eckl. & Zeyh.) Steud. syn. patulum Jacq. compositum L'Herit. syn. laevigatum (L.f.) Willd. cortusaefolium Jacq. syn. tabulare (Burm.f.) L'Herit. divaricatum (Thunb.) DC. syn. fruticosum (Cav.) Willd. diversifolium Wendl. syn. laevigatum (L.f.) Willd. formosum-grandiflorum Cels. syn. grandiflorum (Andr.) Willd. fruticosum E. Mey. syn. fruticosum (Cav.) Willd. fuscatum Jacq. syn. tabulare (Burm.f.) L'Herit. hippocrepis L'Herit. syn. tabulare (Burm.f.) L'Herit. macowanii Bolus syn. laevigatum (L.f.) Willd. marmoratum (Eckl. & Zeyh.) Steud. syn. patulum Jacq. oxyphyllum DC. syn. laevigatum (L.f.) Willd. saniculaefolium Willd. syn. tabulare (Burm.f.) L'Herit. trifoliatum (Andr.) Sweet syn. laevigatum (L.f.) Willd.